"Overall the book provides an excellent resource not only for those who are concerned with macro-ergonomics issues but also for those with a general interest in ergonomics….Additionally, anyone with a role in organisational interventions at the individual, system or organisational level, will find the book of value and should enable work systems to be optimised, yielding organisations that have improved worker well being and productivity, and are better placed to meet future challenges, in particular change." "Hendrick and Kleiner's much-needed resource comes in handy for human factors/ergonomics (HF/E) professionals by taking understanding of macroergonomics to a higher level….This book is organized and presented well, making it a pleasurable must-read for those seeking to understand macroergonomics and to take advantage of its potential. It is also an excellent source for a great amount of research done in this field, as it presents the state-of-the-art of macroergonomics research and applications. 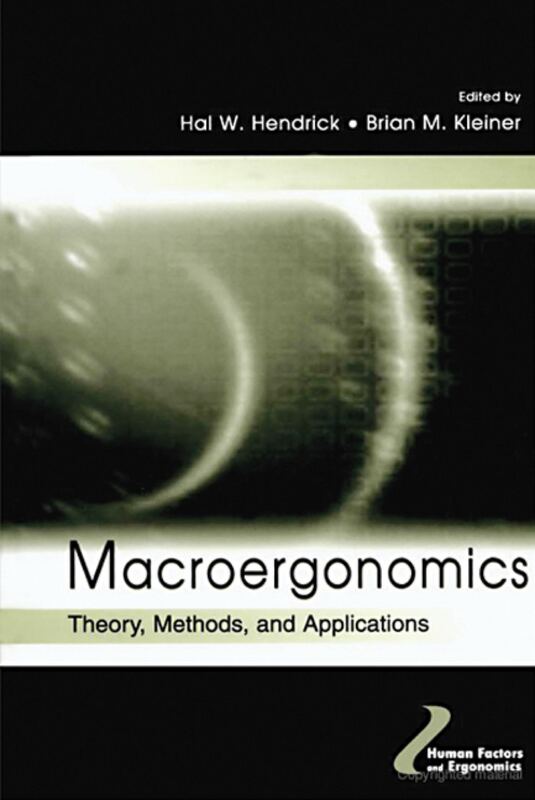 The book will be particularly helpful for teaching macroergonomics to undergraduate and graduate students." Contents: Preface. G. Salvendy, Series Foreword. Part I: Introduction to Macroergonomics. H.W. Hendrick, An Overview of Macroergonomics. O. Brown, Jr., Macroergonomics Methods: Participation. H.W. Hendrick, Macroergonomics Methods: Assessing Work System Structure. M.M. Robertson, B.M. Kleiner, M.J. O'Neill, Macroergonomic Methods: Assessing Work System Processes. H.W. Hendrick, Other Methods for Assessing Work Systems. M. Nagamachi, Relationships Among Job Design, Macroergonomics, and Productivity. B.M. Kleiner, Laboratory and Field Research in Macroergonomics. Part II: Macroergonomic Applications. A.S. Imada, A Macroergonomic Approach to Reducing Work-Related Injuries. G. Bradley, Information and Communication Technology (ICT) and Changes in Work Life: Macroergonomic Considerations. T.J. Smith, Macroergonomics of Hazard Management. W. Karwowski, J. Kantola, D. Rodrick, G. Salvendy, Macroergonomic Aspects of Manufacturing. M.M. Robertson, Macroergonomics in Training Systems Development. B.M. Kleiner, Macroergonomics in Large-Scale Organizational Change. J.H. Smith, W.J. Cohen, F.T. Conway, P. Carayon, A.D. Bayeh, M.J. Smith, Community Ergonomics. H. Shahnavaz, Macroergonomic Considerations in Technology Transfer. N. Meshkati, Macroergonomics and Aviation Safety: The Importance of Cultural Factors in Technology Transfer. N. Meshkati, Macroergonomic Root Causes of Large-Scale Accidents: Three Mile Island, Bhopal, Chernobyl. K.J. Zink, A Vision of the Future of Macroergonomics.